​Comments: Hemi can be stubborn but is generally well natured . She could do with some basic training . Never had pups or been pregnant. Does not like being separated from the boy . Does not do well with loud noises. ​Would preferably suit someone who can take on both dogs . ​Comments: Generally well behaved and follows basic commands . Responds very well to training . He can be over protective of strangers and needs socialising with other dogs He get along fine with other pets such as rabbits , cats etc . He would require someone who is confident with him because he seems to take advantage of people if he notices there unsure of him . He gets scared of loud noises such as storms or gun shots . He has always been fine with my 3 kids but does get a little pushy at times. ​Would preferably suit someone who can take on both dogs . a family environment, he is good with children and has generally been an indoor dog. He has had some formal training however needs a new home due to his current family's situation. Please feel free to contact Bree direct for any further information. 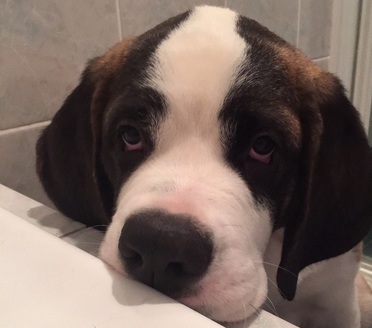 The St Bernard Club is in contact with RSPCA Sydney, who have a St Bernard needing a home. His Name is Boston. Boston has been cared for by RSPCA for a short period where he has been recovering from issues generally related to poor care. He is a 7 year old rough coat and needs a suitable home. Comments: Bruno is a pedigree St Bernard, 4yrs old. He is a beautiful family dog, he adores the kids and loves going for slow steady walks in the paddocks. Bruno has been with us since he was eight weeks old and is desexed, fully inoculated and micro chipped. Bruno was brought up with Daisy our golden retriever but other than that, in the last two years he has not mixed with other dogs and on the odd occasion that we have met another dog, he has lunged and barked at them, therefore he will need training in this area. Bruno will only be rehomed to a family that have experience with Saints or giant breeds. If you think you can give Bruno a fantastic home please contact me. We have until the end of April to find him a home. We would love it if Daisy could go too, so they could stay together but Bruno is the priority. Please contact Lyndsay direct for any further information. 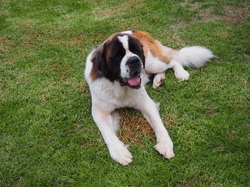 The Club was made aware of a Saint Bernard being cared for by Fetching Dogs Rescue (NSW). He is desexed and has been vet checked. All our dogs are rehomed Vaccinated with C5, wormed, heart worm tested, desexed and microchipped. Comments: Bessie is a loving and affectionate 2 year old female. She has a stable temperament but is excitable and needs some attention and training. Please feel free to contact Josh direct for any further information. Comments: Thor is a 30 month old desexed, vaccinated, wormed and microchipped male St. Bernard who's looking for a loving home. Thor is under the mistaken belief that he’s a lap dog and will try to cuddle you, attempting to eventually settle on your lap! He enjoys an indoor/ outdoor lifestyle, sleeping indoors and would require regular grooming. Thor’s adoption fees is $600. Additionally Xena, Thors best friend (shown in the photo an 18 month old female Dogue de Bordeaux, aka French Mastiff) are desexed, vaccinated, wormed and microchipped dogs who are looking for a loving home, either together or apart. Xena and Thor’s adoption fees are $600 each. If interested, please call Michaela from www.tars.org.au on 0409 21 31 31 (Sunshine, Victoria based but we go to you. Please note we can only rehome in or around metropolitan Melbourne). Sebastian was a 2 year-old surrendered to the Club in November 2012. He is now living with a loving forever home with another Saint after receiving physical reconditioning and social rehabilitation. The Club is grateful to his new family for taking this special boy. Honey Bear, a 9 year old girl, was rehomed on 25th November 2011. She was much loved but was unable to be cared for by her existing owner due to illness. After a referral to the Club by the RSPCA we were able to find a new loving home at Chester Hill from our waiting list. Hello, my name is Tyson. After three previous homes, I was rehomed with my new family at Katoomba in 2010. My new Dad Jeff has always wanted a Saint and my new mum loves me too, my brothers think I am pretty cool to play with but are not sure about the slobber. BamBam rehomed at Cooranbong in 2001. Pebbles rehomed at Pagewood in 2002.